← Led Astray by His Brother? The usual image that pops into my mind when I think of “old homestead” (this week’s prompt) is an expanse of land upon which stands a house that one family has occupied for generations. Well, that doesn’t apply to my family. The only one close is the old O’Brien home, and that was a different branch from my direct ancestors. My choice is the house where I spent the first ten years of my life. The street got it’s name from a World War I training camp, Camp Greene, named after Nathaniel Greene. The Camp opened in 1917 on 2,400 acres of land between Wilkinson Boulevard and Tuckaseegee Road in Charlotte, North Carolina. The land was purchased from families like James Dowd and Charles McKinley, father of my paternal grandmother’s sister-in-law Mattie McKinley Primm. The camp eventually expanded to 6,000 acres, stretching from near downtown and west to the Catawba River and Gaston County. Among other considerations, the Army chose the southern site because they thought the winter would be milder than those up north. Unfortunately, the winter of 1917-1918 was the worst in 50 years. When the snow finally melted, the red clay mud was a foot deep, interrupting training for several months. The Army considered leaving, but decided to stick it out for the duration of the war. The camp housed around 60,000 soldiers, more than doubling the population of Charlotte and boosting the local economy. The city within a city contained wooden barracks, multi-bed tents, a bakery, a post office, and a 2,000-bed hospital complex. And there were the combat-related assets: trenches, a rifle range, an airfield. The base also had a stable for horses and mules, winding down their wartime duty as the Army transitioned to tanks and trucks. The only surviving structures from the camp are the Dowd family farmhouse (a historic site), used for headquarters, and a couple of the barracks that were converted into permanent housing. Aunt Mattie’s family got at least some of their land back. Several real estate companies eventually purchased some of the land and began developing homes in the area. One of these companies was what is now Marsh Properties, and my parents purchased a brand new house from them for their first home. 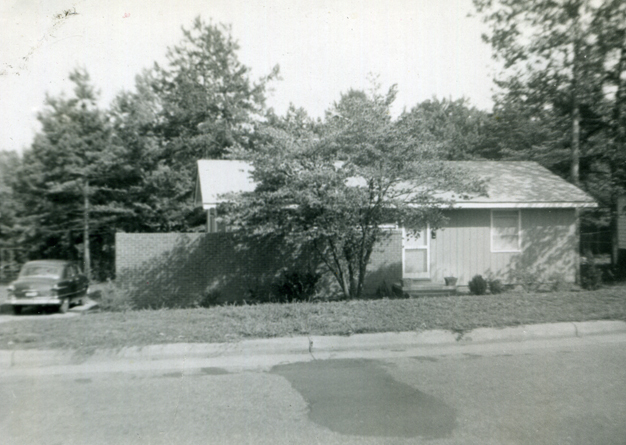 The house when it was new. Six months before I was born, Daddy and Momma signed on the dotted line for their new 950-square-foot house on Camp Greene Street. The house sits on .44 acres of land, 73.44 feet across the front, 41.89 feet across the back, 331.16 feet down one side, and 321.93 feet down the other side. The lot slopes a bit in the front and then levels off, providing a place for the house and a fairly level back yard. Then the lot drops several feet and levels off again until it reaches a creek. On the other side of the creek the land goes up again; about half way up the hill is the end of the lot. There were mature dogwood trees next to the house in both the front and back yards. A large tulip poplar tree was in one side yard, and pine trees dotted the sides of the back yard. When the lot drops, the woods begin. The house is small. The wood siding was painted gray, and a brick wall extended from the front door beyond the side of the house, making a small private area next to the driveway. The door to the crawl space was next to the side steps toward the back of the house. Daddy dug out enough dirt so he could stand, and set up a workshop under the house. It was too deep for us to get in and out by ourselves, but with Daddy in there, he’d help us down and we’d watch him fix things. There was pale yellow linoleum in the kitchen and bath, and hardwood floors throughout the rest of the house. Entering from the front, the living room is to the left. We used the far end as a dining area. There’s a door to the side yard at the end of the room along with a window. There are three windows in the living room that are short and close to the ceiling. Behind the dining area is the kitchen. 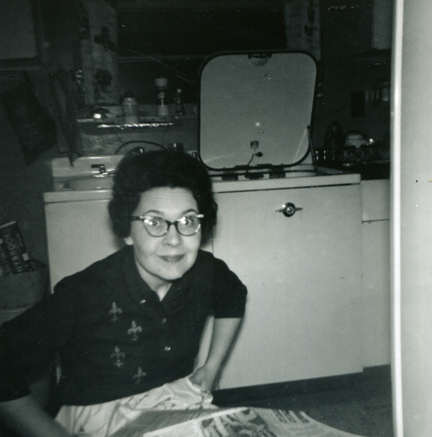 It contained, counter-clockwise from the door, a refrigerator, freezer, dishwasher, sink, washing machine and stove. Momma sitting in the doorway between the kitchen and the paneled room. The dishwasher and sink are in the background. There was also a door just to the right of the one from the dining area that led to a small wood-paneled room. This room had various uses, including dining, a den, and a bedroom. Opposite the door from the kitchen was a door to a small hallway. From that doorway, going clockwise around, were a linen closet, the door to the bathroom, the door to the kids’ room, (I think a coat closet), the door to the master bedroom, and the opening to the living room. After we were born, my siblings and I all came home from the hospital to this house. 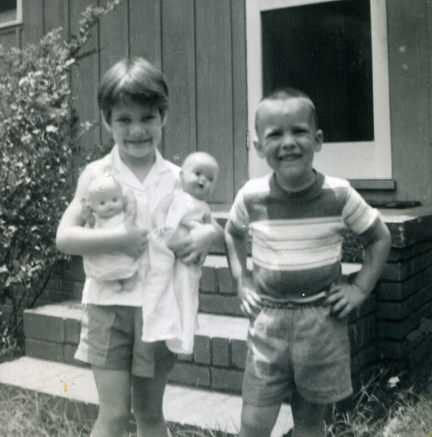 There were a lot of other young families in the neighborhood, and we never lacked for playmates. The Voights lived on the driveway side of the house and the Garrises on the other side. The Garris kids were old enough to babysit for us. Next to the Garrises was the Helms family, with three kids. Across the street were the Carter family (four kids), the Phillips family (four kids), a few kids that I don’t remember last names (Cecil, Barbara, Robbie, Jeff, Mary Beth), and the Gary family. Kays Gary wrote for the Charlotte Observer and on at least two occasions, he wrote about the neighborhood and included pictures. The front yards of all the houses had oodles of clover. The girls on the street would often make clover chains. One day we decided to see how long we could make one; it outlined at least two front yards. Kays called for a photographer and got to writing. The mothers on the street got together occasionally to play bridge. One year they decided to take the cards to the beach for the weekend before Mother’s Day, leaving their husbands to take care of the kids. Although Kays didn’t write the article, he sent a reporter and photographer to the beach with the mothers, and to our street to photograph Saturday morning. A one-page article with pictures appeared in the Sunday paper. Daddy was out of town and missed all the fun. 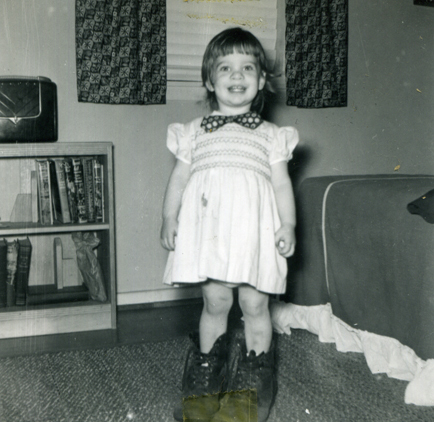 Here I am in Daddy’s boots and bow tie. 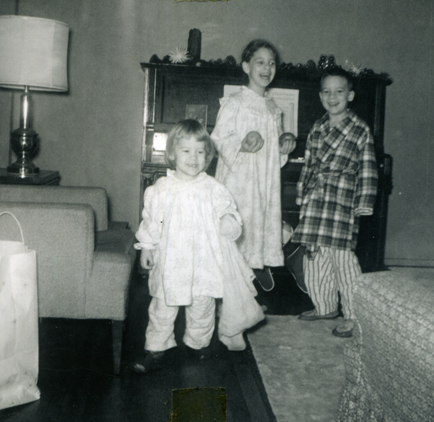 My earliest memory, when I wasn’t quite two years old, takes place in my parents’ bedroom. Daddy thought it would be cute to dress me up in his boots and a bow tie. I remember thinking how silly it was! My brother and I shared the kids’ bedroom and the paneled room was a dining room/den. Eventually, my sister and I shared the corner kids’ bedroom, and my brother got the paneled room to himself. 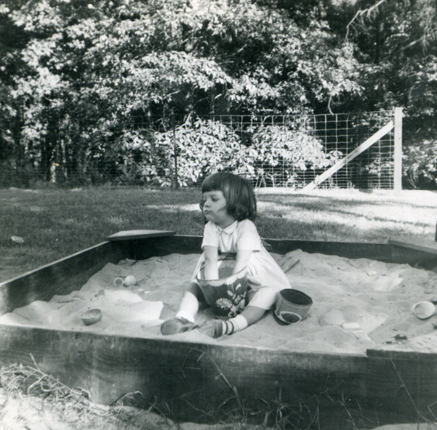 Daddy added a sandbox to the back yard, providing hours of entertainment making mud pies and hoppy-toad houses. As we kids got older, he cleaned out the scrubby undergrowth in the woods between the backyard and the creek. The wild violets, however, were still there and flourished. I would pick violets until my tiny hands couldn’t hold any more and take them home to put in a little tea-set pitcher. My brother liked looking for crawfish in the creek and took one to school in a large tin tub. It stayed there until the end of the year. On the sloping bank above the creek behind the Garris house, a large oak tree spread its roots out above ground. This was a fun place to take miniature cars and build roads to drive them on. The tree also had carvings on it. Daddy said that was left over from the camp that existed before the war. The carvings looked like hieroglyphics to us, and were possibly some kind of code the soldiers used—or just scratchings they did to pass the time. Momma’s family (the McKenzies) sitting on the sofa in the living room. In the background is the dining area and the door to the side yard. 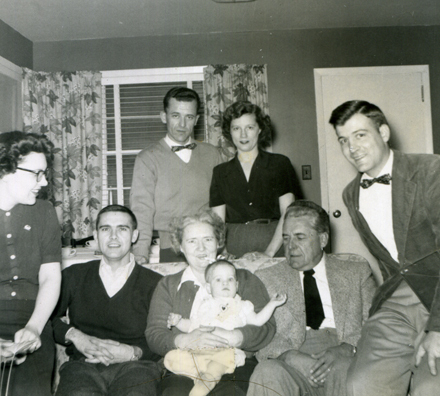 Front: Momma, Uncle Benny, MaMa holding me, PaPa, and Daddy. Uncle Mac and Aunt Betty in the front. The living room changed looks over the years. Momma would repaint, make new curtains, and send the furniture out to be recovered. For one of these makeovers, Daddy took us to the beach and Momma stayed home and painted the living room. In another makeover, Momma decided we needed a den more than my brother needed a room of his own, so she made bunk beds out of the twin beds in the room I shared with my sister (they were made to be able to do that), and brought my brother’s bed into that room. The living room furniture was out for recovering, and late at night after everyone had gone to bed I realized I had not read my homework assignment. Guilty, I climbed down from the top bunk, got my book, and sat on the floor in the living room to read the assignment. I think crying was involved (it was scary climbing down from that top bunk). When we got home from school the next day, the beds were back like they had been, the den idea gone—Momma didn’t like making up that top bunk, so she put it all back the way it was. Excited to find what Santa brought. The old piano is in the background. I don’t remember when exactly, but Momma bought a used upright piano from Queens College and put it on one end of the living room. She taught me the basics of notes and which keys were which, and I progressed through a few beginner piano books. I begged for lessons, but that didn’t happen until we moved to Rockingham. By then, bad technique was ingrained in me and I was a hopeless case for my poor piano teacher. When I was nine years old, Daddy got a promotion and transfer to Rockingham. He started working there before we moved. We thought we might move over the Christmas holidays, but I guess my parents thought it best not to move us in the middle of the school year, much less interrupt Christmas. After the end of fourth grade, after my tenth birthday, we moved. I wouldn’t call the time spent in this house idyllic; after all, there were the usual sibling spats. Innocent or carefree might be better terms to describe those first ten years. This entry was posted in 52Ancestors, McKenzie, Rohleder. Bookmark the permalink.